Product prices and availability are accurate as of 2019-04-23 22:04:52 BST and are subject to change. Any price and availability information displayed on http://www.amazon.com/ at the time of purchase will apply to the purchase of this product. American Standard has the toilet to meet your bathroom’s needs. 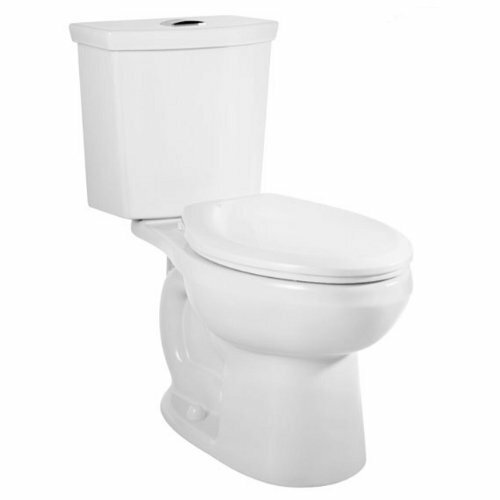 With this American Standard toilet you can conserve water and save money with every flush. Our innovative new Dual Flush H2Option toilets allow you to save water while providing you with the flexibility to choose between a mere 1.0-Gallon flush or a standard 1.6-Gallon flush. Featuring a two button actuator on top of the tank, the Dual Flush toilet gives you the ability to choose the most appropriate water saving flush every time. This two-piece toilet features siphon jet action and a fully glazed 2-Inch trapway to keep your toilet from clogging up. Every flush also helps to clean your toilet bowl thanks to PowerWash technology from American Standard. American Standard has also made cleaning easier with its EverClean surface. The EverClean surface is an antimicrobial coating that inhibits the growth of stain and odor causing bacterial. It helps keep the toilet cleaner longer, even after years of use. It’s just one more feature available from American Standard to make your daily life easier. The H2Option siphon dual-flush has a generous 9-Inch by 8-Inch water surface area. This toilet also features a sanity bar on the bowl. This two-piece toilet has a chrome plated top mounted push button actuator and two color-matched bolt caps. The seat is not included. This toilet also comes with a 5-year warranty from American Standard. This model is available to purchase in white, linen, and bone.